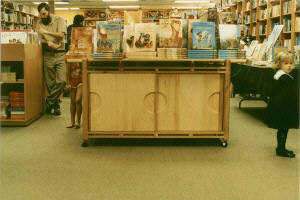 The Children's Book and Music Center moved to Santa Monica in 1980 and remained in business at its Santa Monica Blvd. location for about ten years. 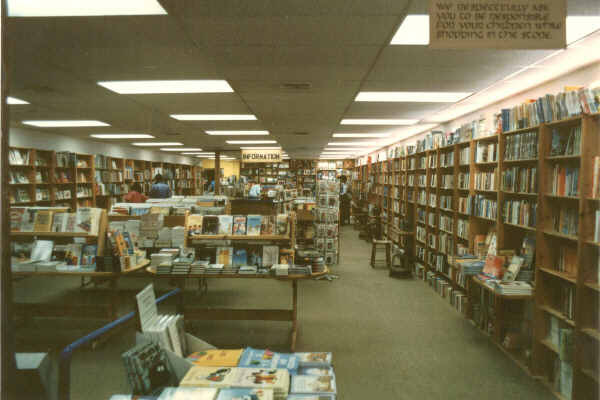 At the time it was said to be the largest children’s bookstore west of the Mississippi. The entire interior furnishings were designed and built by myself over a period of about six months. Besides approximately 250 feet of adjustable bookshelves I designed and built a dozen large trestle tables, book racks, display cases and several very special storage unit/ tables. Some of which may be seen here. Here is a close-up view of some of the modular shelving units I designed. All of the vertical uprights are the same. Each has a large number of holes drilled in a special pattern that allows the most adjustable combinations possible. 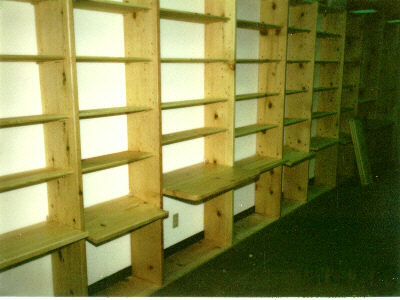 Also provided were accommodations on each shelve to display oversize books and books face out. Large lower shelves were made to hold larger items and incorporated desk units were added that held record players, tape recorders and other items. Materials were oiled and waxed dry knotty pine.Click on picture.